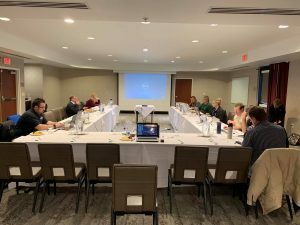 On February 12, staff from the Virginia Office of EMS and members of the Virginia EMS Symposium Program Committee met to select classes for this year’s symposium. We are excited to bring you the best Virginia EMS Symposium yet, and it is because of the dedication and commitment of staff and committee members that we are able to offer the most renown speakers and EMS classes in the nation. Stay tuned for more information coming soon, including registration and room block details. The Virginia EMS Symposium is one of the nation’s premier educational opportunities for EMS providers and Registered Nurses to obtain continuing education and network. Each year, more than 1,600 registrants choose from over 360 different programs across this 5-day training event. National and local educators participate to make this event one of the top prehospital educational opportunities in the country. The Symposium has 12 tracks covering Airway, Respiration, Ventilation, Cardiac, Critical Incident Stress Management, Communications, Critical Care, Educator, Leadership & Management, Medical, Operations, Preconference, Safety, Special Considerations and Trauma.